Scheepvaartmuseum / The National Maritime Museum - Stout & Co.Stout & Co.
Het Scheepvaartmuseum, the National Maritime Museum, shows how our culture has been shaped by the sea. Stimulating, interactive exhibitions allow visitors to explore 500 years of maritime history. Attractive object exhibitions show the best of our world famous collection. We have special exhibitions for children, including See you in the Golden Age and The tale of the whale. We even have one for children under the age of 6: Sal & Lori and Circus at Sea. And last but not least: the exciting ride Voyage at Sea (8+) and the famous replica of the East Indiaman Amsterdam is back at the quay. 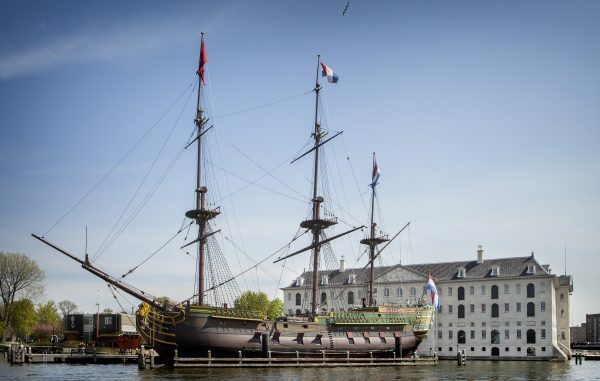 Het Scheepvaartmuseum has been completely renovated, but still exudes history and is a beautifully imposing and impressive building in the heart of Amsterdam.